Today, we are announcing the general availability of App Service Isolated, which brings the simplicity of multi-tenant App Service to the secure, dedicated virtual networks powered by App Service Environment (ASE). Azure App Service is Microsoft’s leading PaaS (Platform as a Service) offering hosting over 1 million external apps and sites. It helps you build, deploy and scale web, mobile and API apps instantaneously without worrying about the underlying infrastructure. It allows you to leverage your existing skills by supporting an increasing array of languages, frameworks, and popular OSS, and has built-in capabilities that streamline your CI/CD pipeline. ASE was introduced in 2015 to offer customers network isolation, enhanced control, and increased scale options. The updated ASE capabilities that comes with the new pricing tier, App Service Isolated, now allow you to run apps in your dedicated virtual networks with even better scale and performance through an intuitive user experience. Scaling up or out is now easier. The new ASE eliminates the need to manage and scale worker pools. To scale, either choose a larger Isolated plan (to scale up) or add instances (to scale out), just like the multi-tenant App Service. It’s that easy. To further increase scaling flexibility, App Service Isolated comes with a maximum default scale of 100 Isolated plan instances. You now have more capacity for large implementations. The new ASE uses dedicated Dv2-based machines boasting faster chipsets, SSD storage, and twice the memory per core when compared to the first generation. The dedicated worker sizes for the new ASE are 1 core with 3.5 GB RAM, 2 cores with 7 GB RAM, and 4 cores with 14 GB RAM. With this upgraded infrastructure, you will be able to run your apps with lower latency, have more power to handle heavier workloads, and support more users. Creating the new ASE is easy. By selecting the Isolated pricing tier, App Service will create an App Service Plan (ASP) and a new ASE directly. You will just need to specify the Virtual Network that you want to deploy your applications to. There is no separate workflow required to spin up a new ASE in your secure, dedicated virtual networks. 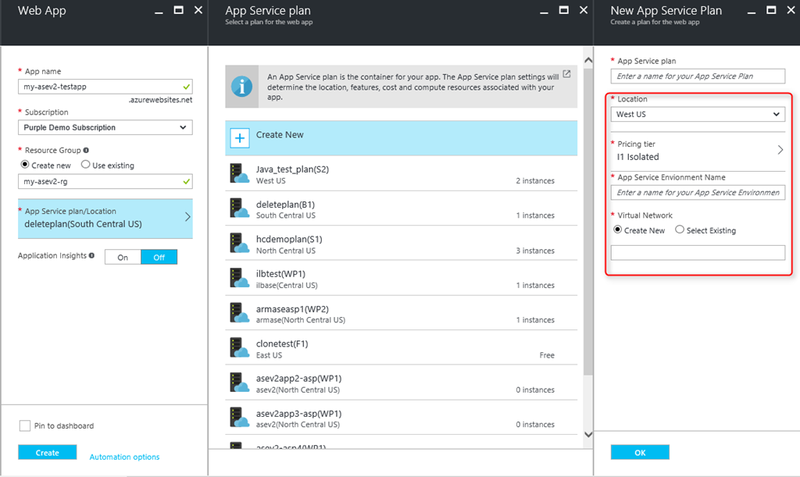 We’ve made App Service Environment (ASE) faster, more efficient, and easier to deploy into your virtual network, enabling you to run apps with Azure App Service at high scale in an isolated network environment. Check out the Azure Friday video. Partners and customer can also learn more about how to get started and set up.